Posted on April 1, 2015 by Lea S.
From comic strip The Whole Blooming Family, 1916. But did you ever wonder where this classic gag come from? Why were banana peels in particular an ever-present hazard to a screen comedian’s life and limb? Turns out, the origin is farther back than films, and even farther back than the vaudeville stage. And even farther back than this 1910 postcard. Back in the 19th century, litter was a problem on many city streets. The problem increased with industrialization as more and more people flocked to the cities. Fruit was a popular snack sold at numerous street stands, and fruit peels would often end up littering the public sidewalks. Banana peels were a particular menace since they were not only slippery, but became even more slippery as they rotted into a greasy mess. And thus the banana peel became a common annoyance, a national in-joke as well known as today’s riffs on teenagers being glued to their smartphones. Punch, Volume 153, July 11, 1917. 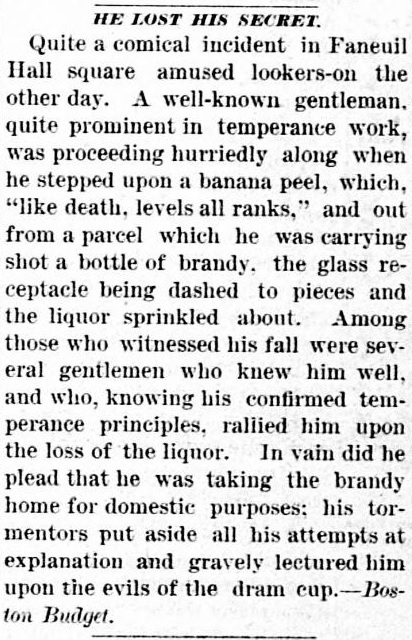 There’s a theory out there that “banana peel” was actually a polite euphemism for pet droppings, part of the modern tradition of trying to link innocent old-time things with something nefarious (or, in this case, yucky). 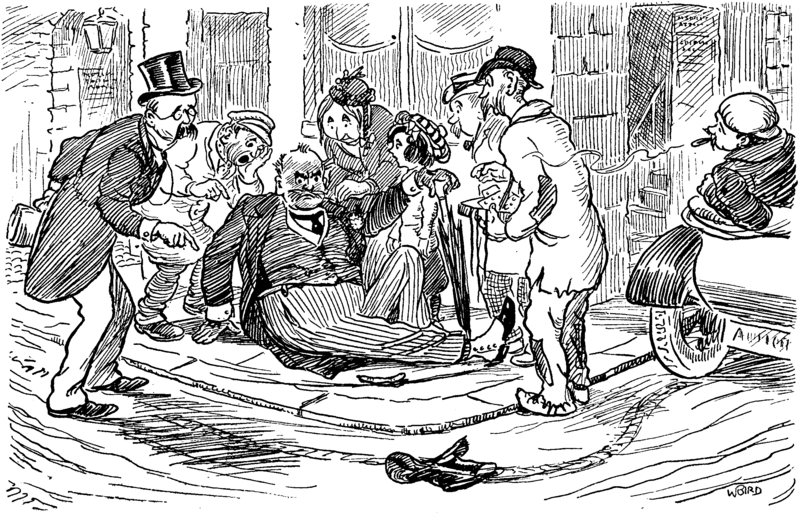 Supposedly those squirmy Victorian comedians certainly couldn’t mention or depict excrement on the stage, so banana peels were substituted and audiences made the obvious connection of “yellow fruit peel = my dog’s business” without a second’s thought. But, research has shown that this story isn’t true. “EVIL TO HIM WHO EVIL THINKS”–Never entertain suspicious thoughts of your neighbors; if you can’t clearly account for all their actions, give them the benefit of the doubt…If you step on a piece of banana peel, and slip and dislocate your ancle [sic] in front of a doctor’s office, don’t entertain an idea that the M.D. put it there in hopes that somebody would break his limbs and give him a job. In spite of all that has been said by the papers about throwing banana peelings and such like things on the sidewalks, the custom prevails in Memphis to an extent not equaled anywhere that we know of. On almost every corner there is a fruit stand, around which the sidewalks are littered with these dangerous parings, and not a day passes that someone does not receive a fall from stepping on them. The amount of profanity which results from the presence of banana rinds and orange peel on the sidewalk is fearful. Several persons have had falls from stepping on these treacherous articles, which sufficiently hint that a little care on the part of those who eat such luxuries may save a doctor’s bill. 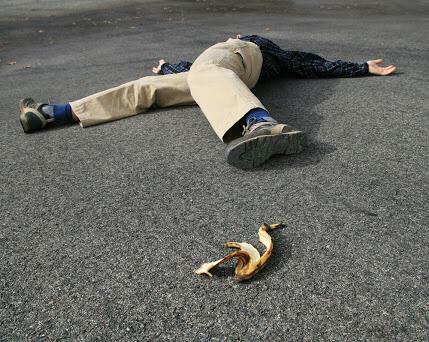 FALL ON BANANA PEEL KILLS. New York, Nov. 1.–Jacob Bopp, a chauffeur of Brooklyn, slipped on a banana peel and died within a few minutes of a fracture of the skull. Nowadays, and contrary to this overwhelming evidence which ought to strike fear into their hearts, people sometimes put the ol’ banana peel gag to the test. The show Mythbusters did a bunch of experiments and decided that the peels were definitely slippery but that a bad fall on just a single peel (like you see in the movies) “isn’t likely to happen by accident” (Thomas O. Thompson, Esq., the Mayor’s Secretary, and Jacob Bopp would beg to differ). But there’s one fact that Mythbusters didn’t know–the bananas we eat today weren’t the same as the bananas of yesterday. Nowadays, the banana we all eat is a variety called Cavendish. But from the 19th century up until the 1950s, the common variety was the Gros Michael. The Gros Michael was sweeter, creamier, and didn’t bruise as easily as the Cavendish. And the individual peel was…more slippery. These ain’t your grandmother’s bananas…wait, actually they totally were. In the 1950s, a devastating strain of Panama disease spread through banana plantations in Central and South America, almost destroying the Gros Michael variety all together. Growers had to switch to the Cavendish variety that we commonly eat today–less tasty, but resistant to the disease. The more you know! So how did slipping on those yellow peels become a comedy routine, specifically? As we know, art imitates life. 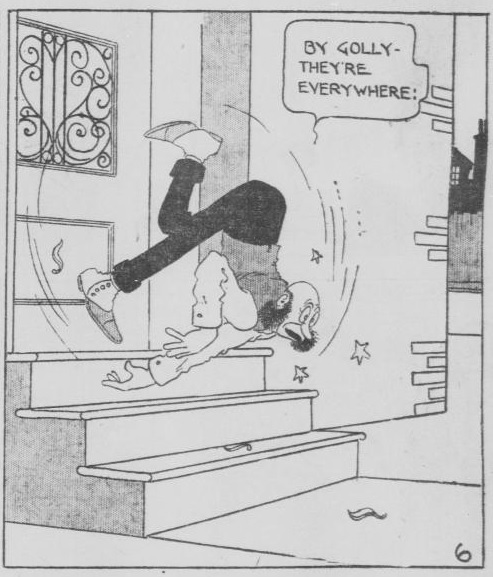 As I said earlier, the idea of slipping comically on a fruit peel was a kind of widespread in-joke, and it didn’t take long for it to creep its way into stage routines and comic strips (which were huge back in the day). Puck, Volume 13, Number 335, August 8, 1883. The race has sweetened and shed some barbarism since the old gladiatorial days, but you couldn’t see a grocer’s boy with a basket of eggs slip on a banana peel and alight upon his left ear and the eggs together without a smile or something more noisy. As proof of it, the slipping on a banana peel episode has been so done to death by the funny papers that it is tabooed now entirely as too old. There was also a vaudevillian named Cal Stewart who incorporated a ton of banana peel jokes into his stage routine as a character named “Uncle Josh.” We can assume plenty of other comedians made do with the funny fruit trope, too. And that brings us to the movies! Mental Floss said that the tried-and-true gag entered the movies via Harold Lloyd’s short The Flirt, released in 1917. It’s also been suggested that Charlie Chaplin was the first to use them in By the Sea (1915). Oh, no. Heavens no. Positively no. There’s no way that entered films as incredibly late as 1915. Charlie was but partaking in a long established tradition. In fact, it entered films at least as early as 1905, when the Crescent Films company released a series of everyday “scenes” including one called What a Banana Peel Will Do. And it wouldn’t surprise me at all if there were even earlier films making use of the offending fruit. There has been altogether too much of what is known as “rough-house” and “slap-stick” comedy. The patrons are surfeited with it and the exhibitors have had more than a genteel sufficiency. It would be well to try for a finer and somewhat cleaner vein. We are glad to observe a tendency to follow this new direction. A creation of comic types from life and the making of situations which rouse laughter without the fatal banana peel and the seltzer bottle mark the coming of new kinds of comic film. I could find relatively few photos of silent comedians and banana peels, so here’s this guy. Another screamingly funny comedy of the nonsensical sort. Ford Sterling gives a most enjoyable characterization of Dr. Noodles, who places banana skins on the walk in order to get patients. This reel works up into a highly diverting situation. A good comedy number. 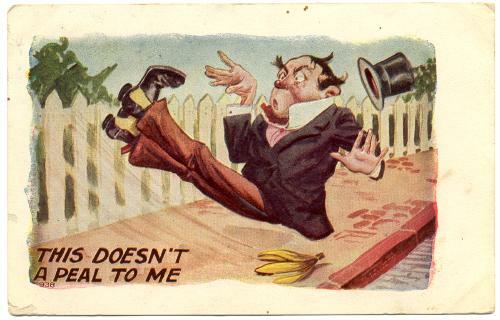 And thus the banana peel would make persistent cameos throughout early 20th century comedy, especially in the more low-budget efforts–although by this time it had lost it’s original context of “symptom of the litter problem” and was simply “a thing to cause funny pratfalls.” As it still remains to this very day. In later years Keaton admitted that he was never fully comfortable with this gag, thinking it was maybe “outsmarting the audience a little too much.” Sorry, Buster, but this gag has totally stood the test of time. There’s nothing better than showing it to an uninitiated audience, because as soon as they see the banana peel they assume that of course the hero will slip on it–this is a 1920s film after all, right? Isn’t this where that old gag came from? But then when he doesn’t the audience is taken totally by surprise. And I love it. Later in his career, you might say that the peel finally had it’s revenge–in The Cameraman (1928) Keaton falls while going out on a stroll with his crush. In this case, the joke might be how ludicrous it was for his character to actually slip on a banana peel, of all the silly things. Today, decades after the era of the silent clowns, the idea of slipping on those yellow peels is firmly entrenched in our comedy culture. The historic context is long gone, but the gag remains, still dippily hoping to please. You’ve got to wonder if it’s here to stay, and if future generations will still be chuckling at it, if only out of familiar habit. I’m guessing it will be. At the end of the day, satire and witty references will become dated and forgotten…but goofy pratfalls are simply always going to be funny. 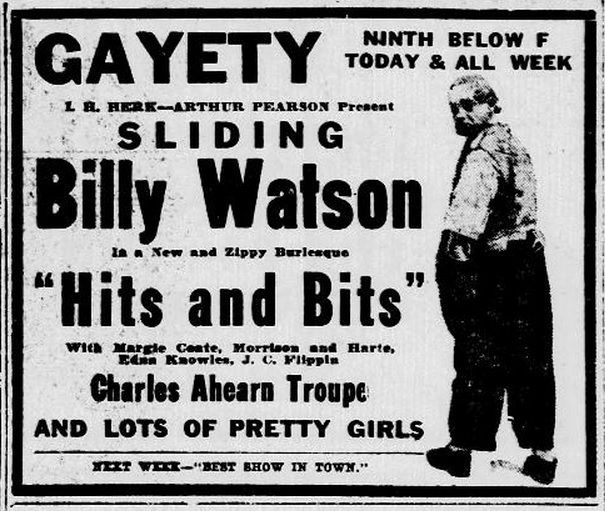 This entry was posted in History and tagged banana peel gag, Buster Keaton, Charlie Chaplin, pratfalls, silent comedy, slapstick, Slipping Billy Watson, vaudeville by Lea S.. Bookmark the permalink. Thank you for the enlightenment. My appreciation for the gag has increased although I am, at heart, a “step on a rake” gal. Thanks for the info…Interesting, as usual! HAW!! Glad you enjoyed it, HT! Loved. So much fun reading this! This was really interesting. WHO KNEW there was so much to the ol’ slip-on-a-banana-peel routine? Certainly not me. Nicely written, Lea!!!! Does such information exist on the spit-take, my personal favorite? I really enjoyed this article!! Wish I could ‘love’ it instead of merely ‘like’ing. 😀 I feel enlightened! Thank you so much! This was a fun one to research. I linked this article today on twitter under the hashtag #SlapstickFall for the TCM/Ball State course. Right?? They weren’t always tactful back then, that’s for sure. If I ever added anything to this article, it would be that banana peels do get slipperier when they start to rot. (I don’t think I included that for some reason.) You can see how the ground would be treacherous around a fruit stand on a hot summer’s day!